A European Boycott of Israel? Where is the European Union headed in its policy toward Israel? Its recent decisions seem to be building momentum in opposite directions at the same time. One path is marked by important new agreements expanding economic cooperation with Israel. The other is shaped by a new EU directive that could encourage boycotts of Israel's major banks and many of its key companies and research institutions. On the positive side, in July 2012, the EU took unprecedented measures to enhance its relations with Israel in sixty trade and diplomatic policy areas, including increased access to its single market, closer cooperation on transport and energy, and enhanced ties with nine EU agencies. And in October 2012, despite fierce opposition from the boycott, divestment, and sanctions (BDS) movement seeking such actions against Israel, the European parliament ratified a critical framework agreement to facilitate the export to Europe of Israeli industrial products. The Israeli Foreign Ministry called it "an extremely important agreement" that "deepens the bilateral relations between the EU and Israel" while the Council of the European Union, the union's supreme executive authority, welcomed both agreements as showing "the significance the EU attaches to its relations with the State of Israel" and "the importance of further developing our broad, bilateral partnership." 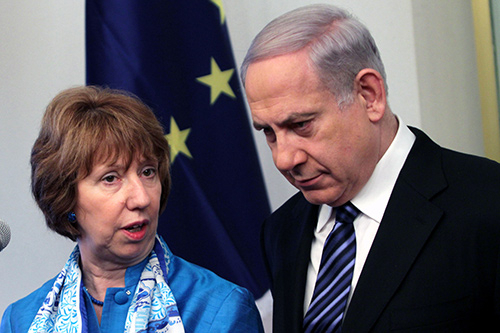 Catherine Ashton (left), the EU's foreign policy chief, has been outspoken in her criticism of Israeli "settlement" policy. Israeli politicians across the political spectrum, including PM Netanyahu (right) are united in their unhappiness with the EU's recent pronouncements about boycotting Israeli institutions operating beyond the "Green Line." The EU guidelines apply only to settlements but, if strictly implemented, could lead to a wider EU boycott not only of settlement entities and activities but also Israeli institutions operating primarily in "Israel proper." Contrary to these affirmations, the EU also issued a new guideline whose implementation could profoundly disrupt relations with Israel. In July 2013, the union promulgated a new directive that could encourage a boycott of Israeli banks operating in Jewish communities in east Jerusalem and anywhere beyond the pre-1967 lines. The guidelines apply only to settlements but, if strictly implemented, could lead to a wider EU boycott not only of settlement entities and activities but also Israeli institutions operating primarily in "Israel proper." The secondary effects could be even greater as they are adopted by European banks and companies making their own decisions. Tzipi Livni, Israel's chief peace negotiator and chair of the liberal Hatnuah Party, said, "True, [the European boycott] starts with settlement [goods], but their problem is with Israel, which is seen as a colonialist country. Therefore, it won't stop at the settlements, but [will spread] to all of Israel." Prime Minister Binyamin Netanyahu's former national security adviser Yaacov Amidror described the directive as a "conscious decision" to attack Israel politically and economically and a "type of an economic boycott." If implemented in a manner that impedes cooperation with Israel, the guidelines could harm European interests as well. Israel is a very good customer for European products: In 2012, it imported 46 percent more from the EU than it exported back ($26.7 vs. $18.3 billion). Enhanced trade between Israel and the EU is creating more jobs in Europe than in Israel. Israeli purchases from the EU have increased by nearly 50 percent since 2003. Israel now imports half as much from Europe as Australia does and about 60 percent as much as Saudi Arabia. Most European officials acknowledge that cooperation with Israel in research and development is in Europe's interest and not just in Israel's. For instance, Israel was the only non-European country invited to take part in the Horizon 20/20 program promoting research and development, and Europe's countries benefit from closer cooperation with tech-savvy Israeli firms. As CNN reported, American technology companies are also "on a shopping spree in Israel, spending billions on ever larger deals and fueling the country's startup success story. … Microsoft in Israel estimates that about $13 billion in Israeli tech acquisitions have been completed since the start of 2012." Impeding European cooperation with Israeli firms hurts both sides, not just Israel. Any new impediments mean that Brussels is putting a roadblock in front of its own declared goal of expanding trade, investment, and research cooperation with Israel. Article 12 (b) of the guidelines illustrates how the new directive could evolve from a boycott of settlements to a wider boycott of Israel. The guidelines state, for example, that any Israeli financial instrument that operates in any way "either in the framework of EU-funded financial instruments or otherwise" in any territory across the pre-1967 armistice line will be ineligible for cooperation with the EU. A boycott aimed only at settlement production would have only a minor impact from a macroeconomic perspective because only 2 percent of the agricultural and industrial products Israel exports to the EU originate in settlements. According to the Forward, "most Jewish settlements in the West Bank are either bedroom communities for Israelis working within the 1967 borders or homes for service workers employed by the government and local authorities in the West Bank." But a boycott of Israeli companies that have any involvement across the former armistice line, even in Jerusalem, would have a far wider effect. Under article 16 of the directive, entities administering financial instruments of an agreement with the EU must certify that they do not operate at all in the territories, either with EU-funding or in any other way. The guideline implements the EU Foreign Affairs Council position adopted on December 10, 2012, stating that, henceforth: "All agreements between the State of Israel and the European Union must unequivocally and explicitly indicate their inapplicability to the territories occupied by Israel in 1967." Many major Israeli companies and nonprofits inside the pre-1967 lines have at least some incidental or secondary involvement with economic activity that crosses the "Green Line," especially in eastern Jerusalem where half the city's Jewish population lives in long-established communities such as Ramot, French Hill, Neve Yaacov, Pisgat Ze'ev, East Talpiot, and Gilo. These communities are part of the sovereign state of Israel under Israeli law but are treated as "illegal settlements" under the EU directive. A former Israeli official said, "The current EU guidelines document ... is so sweeping that it is unclear whether its full potential impact was understood by those who drafted it." In July 2013, the EU issued a new directive that could encourage a boycott of Israeli banks operating in Jewish communities in east Jerusalem and anywhere beyond the pre-1967 lines. Institutions such as Bank Leumi would be targeted for providing mortgage loans to homebuyers or operating branches in Israeli settlements. If article 12 (b) were strictly implemented, no major Israeli bank would be eligible to provide a financial instrument since all of Israel's major banks have at least some business activity outside the pre-1967 armistice line. A leading organization promoting a complete boycott of Israel has published a study of the entire Israeli banking sector as well as dossiers on Bank Leumi, Bank Hapoalim, Israel Discount Bank Ltd., and Mizrahi Tefahot Bank. It identifies "five categories of operation in which Israeli banks provide financial services to "occupation-related" activities: (1) mortgage loans for home buyers in settlements; (2) financial services to Israeli local authorities in the West Bank and the Golan Heights; (3) special loans for building projects in settlements; (4) operating branches in Israeli settlements; and (5) providing financial services to businesses in settlements. Indeed, banks would be in violation of Israeli law if they discriminated against mortgage applicants in east Jerusalem neighborhoods such as Ramot or Gilo, to which the laws of the state were extended by a center-left Labor government in June 1967. Israel's Jerusalem laws and the city's unification are particular targets of the boycott movement. A recent EU heads of mission report on the city emphasized that policy recommendations on "reinforcing the EU policy on East Jerusalem" single out Israeli economic activity there for a boycott of "financial transactions, including foreign direct investments, from within the EU" and call on the EU to inform European "citizens and companies of the financial and legal risks involved in purchasing property or providing services" in east Jerusalem. Beyond the banks, many of Israel's largest and most innovative companies are targets of the boycott movement and could be declared ineligible for EU programs. Boycott advocates have already built dossiers against Paz Oil Company, Israel's biggest indigenous gas and energy supplier; Elbit Systems Ltd., a leading defense electronics manufacturer; Matrix IT, Keter Plastic (Keter Group), IDB Group, CLAL Group, Delta-Galil Industries Ltd., Gilat Satellite Networks Ltd., Hot Communication Systems, Lithotech Medical, D.N.M Technical Equipment and Tools, Magal Security Systems, Intellitech Engineering Mechanical and Aviation, and Veolia Environment, an Israeli-controlled French multinational. stop loans to virtually all major Israeli businesses and public bodies ... that operate in occupied Palestinian territory … loans worth hundreds of millions of euros each year from the European Investment Bank. 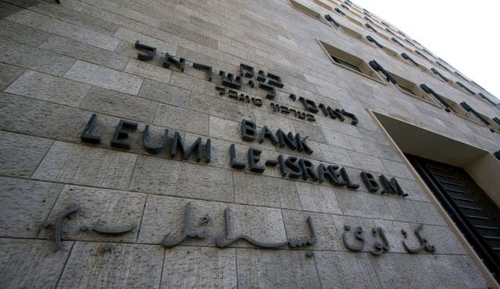 … Among those excluded … will be major Israeli banks including Bank Hapoalim, Mizrahi Tefahot Bank, and Bank Leumi ... Recent EIB loans such as the €120m lent to national Israeli water company Mekorot in 2011 or the €40m lent to electric car company Better Place in 2012 would not have been granted under the new rules as both companies have sizeable illegal settlement activities. It must be assumed that those who negotiated [the recent EU-Israel Open Skies agreement signed in June 2013] on behalf of the EU knew that frequently Israeli air controllers direct incoming planes eastwards, above territory occupied in 1967, not to make a political point but to allow the pilots smoother landings. This is also authorized by the September 28, 1995 Israeli-Palestinian interim agreement on the West Bank and the Gaza Strip, stating: "Aviation activity by Israel will continue to be operated above the West Bank and the Gaza Strip." Yet, in the language of the European directive, the presence of these airlines over the West Bank might be construed as "illegal." Even Israeli universities could run afoul of strict implementation. "All of the Israeli universities have an archaeology department that carries out digs in the West Bank, in Jerusalem, so [as] to exclude all of us from participating in Horizon," according to Eric Zimmerman, academic secretary of the Interdisciplinary Center in Herzliya. 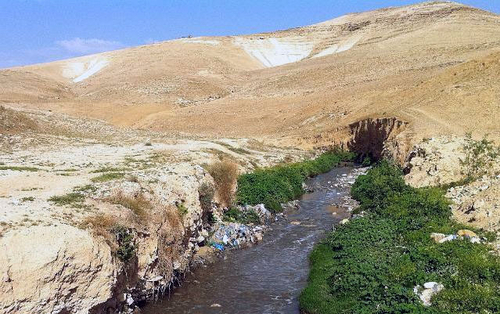 In August 2013, Dutch Foreign Ministry officials informed the Netherlands' largest engineering company that a sewage treatment plant it was helping to build to battle pollution in the Kidron stream, which originates in east Jerusalem, might violate international law, leading the company to consider pulling out of the project to avoid financial, legal, and image problems. The indirect effect of this directive could be even more damaging. Ambiguities about the directive's terms and legal applicability to Israeli entities add a chilling effect to contacts between EU countries and Israel. A European company or bank may ask why it should get involved with Israel if it might run afoul of the bureaucracy in Brussels. Also, organizations promoting boycotts of Israel focus their activities on trying to embarrass any private European firm that has contact with Israeli partners. The stigma of "settlements" could be a scarlet letter to stain almost any Israeli entity that operates in the eastern half of Jerusalem or the settlement blocs that will remain part of Israel under any peace treaty. European companies may, out of an abundance of caution, steer clear of Israeli partners altogether to avoid any possible taint. Alongside the new directive are reports that large European banks are being advised by their investment committees to prohibit loans or aid of any kind to Israeli companies that operate in the West Bank and to Israeli banks that grant mortgages to home builders or buyers across the Green Line. Five European countries are warning their companies against projects over the Green Line, and other EU countries, as well as the EU Commission, are considering warning businessmen to avoid financial activity beyond the 1967 lines. In August 2013, Dutch Foreign Ministry officials informed Royal Haskoning DHV, the Netherlands' largest engineering company, that a sewage treatment plant necessary to battle the pollution in the Kidron stream in East Jerusalem would violate international law, leading the company to consider pulling out of the project to avoid financial, legal, and image problems. Then Vitens, the largest supplier of drinking water in the Netherlands, cancelled a memorandum of understanding with the Israeli national water company Mekorot after the Dutch media and parliamentary debate mentioned that Mekorot drills for water in the West Bank. Vitens, however, continues to work with Coastal Municipalities Water Utility (CMWU), a governmental arm of the Hamas government in Gaza, even though Hamas is on the European list of terrorist organizations. Surprisingly, CMWU also receives funding from the European Union. Financial transactions, investments … [and] other economic activities ... in Israeli settlements or benefiting Israeli settlements, entail legal and economic risks stemming from the fact that the Israeli settlements, according to international law, are built on occupied land and are not recognized as a legitimate part of Israel's territory. This may result in disputed titles to the land, water, mineral, or other natural resources which might be the subject of purchase or investment. EU citizens and businesses should also be aware of the potential reputational implications of getting involved in economic and financial activities in settlements, as well as possible abuses of the rights of individuals. Those contemplating any economic or financial involvement in settlements should seek appropriate legal advice. Finally, EU foreign policy chief Catherine Ashton stated on July 5, 2013, that her office was drafting comprehensive guidelines on labeling settlement products. "An overwhelming majority of Member States have recently supported or openly demanded" such guidelines, which are also required by a bill submitted to the European parliament in February but not yet approved. Israeli experts believe such labeling will lead European retailers to boycott settlement products entirely. The EU directive also lumps together communities strongly supported by the Israeli consensus, such as those in east Jerusalem and the settlement "blocs," with settlements on remote hilltops in the West Bank that have far less support. No major party in Israel or a majority of the Jewish public regards Jewish neighborhoods included in the 1980 "Basic Law—Jerusalem" as occupied territory. Even among Israelis willing to relinquish Arab populated areas of Jerusalem for a comprehensive peace agreement, there is no support at all for sacrificing or impeding Jewish communities inside the city limits. For the Israelis, what they're building in is in part of Israel ... The Israelis are not going to stop ... construction in East Jerusalem ...We could spend the next 14 years arguing over disputed legal issues, or we can try to get a negotiation to resolve them in a manner that meets the aspirations of both societies. Another reality to which the European directive is blind is its failure to treat the "settlement blocs," including Ma'ale Adumim, Modiin Illit, Gush Etzion, and Givat Ze'ev, differently. These bedroom suburbs of Tel Aviv and Jerusalem comprise only 5-9 percent of the land of the West Bank but include about 80 percent of the settlers. They received a special status in the Camp David peace talks in July 2000 when President Clinton proposed and Yasser Arafat accepted that they would come under Israeli sovereignty. In exchange, there would be a swap of land given by Israel from its own pre-1967 territory as compensation. In light of new realities on the ground, including already existing major Israeli population centers, it is unrealistic to expect that the outcome of final status negotiations will be a full and complete return to the armistice lines of 1949… It is realistic to expect that any final status agreement will only be achieved on the basis of mutually agreed changes that reflect these realities. The Israelis understood this to mean that those settlements in the blocs that would remain part of Israel in a future negotiation would be treated differently from settlements outside the blocs agreed to at Camp David. The EU position is blind to this critical distinction. It was clear from day one to Abbas, Rice, and Bush that construction would continue in population concentrations—the areas mentioned in Bush's 2004 letter. I say this again today: Beitar Illit will be built; Gush Etzion will be built; there will be construction in Pisgat Ze'ev and in the Jewish neighborhoods in Jerusalem. It's clear that these areas will remain under Israeli control in any future settlement. Ongoing construction did not prevent the negotiations from achieving significant results. Abbas later said, "There were no failures in the negotiations. We reached agreement on all the core issues. I'm sure that if negotiations [had] continued, within two months we would have reached an agreement." As Yair Lapid noted, heavy-handed EU pressure tactics against Israel feed the Palestinian illusion that international pressure, rather than direct negotiations with Israel and painful compromises, will bring statehood. Acts like the directive undermine the Israelis' confidence that European countries respects Israel's vital interests. Brussels issued this new directive just as the Israeli government was making tough and unpopular concessions, including the release of convicted Palestinian terrorists. Secretary of State Kerry was not happy with the timing of the directive and asked the EU to suspend its application while the peace talks are underway. It undermines Israeli confidence that the Europeans can play a useful role in the peace process. During the past ten years, Israel accepted a European role in at least three cases. But the new guidelines enormously reduce Jerusalem's trust in the EU and willingness to allow EU participation, for example, in monitoring economic and religious aspects of a possible Israeli-Palestinian agreement. Leaders of Israel across the political spectrum warn that the guidelines are harmful and should be amended. Labor party chief Shelley Yacimovich criticized the European Union's sanctions, saying that the correct way to intervene was through positive, encouraging steps. Yesh Atid party leader Yair Lapid asked Brussels to change its decision or at least freeze this step during the current negotiations with the Palestinians. Israel's chief peace negotiator Tzipi Livni tried to convince the EU's Ashton that it is important for EU members to allow Israelis and the Palestinians to negotiate an agreement on the border as opposed to the EU making a unilateral decision. While Brussels routinely condemns Israeli administration in the territories, captured in a war of self-defense, it remains silent in the face of other disputed areas such as Turkish-occupied northern Cyprus or Western Sahara. In fact, it regularly does business with the occupying powers. The EU directive also treats Israel more harshly than other countries administering disputed territories, an inconsistency Brussels refuses to explain. For example, no EU punitive measures have been contemplated against Turkey for its occupation of Northern Cyprus since 1974, nor are products from Turkish-occupied Cyprus labeled by the EU even though the Republic of Cyprus is a member-state of the union. In fact, Brussels gives financial aid to Turks occupying northern Cyprus, 150,000 of whom are regarded as "illegal settlers" by the Republic of Cyprus government. Council Regulation (EC) no. 389/2006 of February 27, 2006, established "an instrument of financial support for encouraging the economic development of the Turkish Cypriot community." Under this regulation, the financial resources allocated amount to €259 million (US$352,965,200), managed by the EU Directorate General Enlargement Task Force for the Turkish Cypriot Community and implemented on the ground from a support office inside Turkish-occupied Cyprus. The EU/Morocco Fisheries Partnership agreement also treats the territorial waters of Western Sahara as part of Morocco's jurisdiction despite the fact that the International Court of Justice ruled that Morocco did not have sovereignty over Western Sahara. The EU does not recognize Moroccan sovereignty in the Western Sahara, and Morocco has been accused by various international organizations of committing human rights violations against the Saharawi people there. But according to article 2(a) of the agreement, EU fisheries can take place in "the waters falling within the sovereignty or jurisdiction of the Kingdom of Morocco." In fact, since Moroccan stocks are largely depleted, the bulk of the fishing under the agreement today takes place offshore Western Sahara. The Frente Polisario, the internationally recognized political representatives of the Western Sahara Saharawi people, condemned the protocol as an "attempt to legitimize the theft of Western Sahara's natural resources." An opinion by the European parliament's legal services in 2009 concluded that the Saharawi people had not been consulted on the fisheries agreement and that there was no proof that they benefitted from it as international law demands. Yet on December 10, 2013, the European parliament approved, by a 310 to 204 vote, a new protocol under which fishing vessels from eleven EU countries will be allowed to fish in the waters of the Kingdom of Morocco in return for an annual EU payment to Morocco of €30 million (US$40,800,000). Other examples of EU double standards may be cited. The draft Broadbased Trade and Investment Agreement (BTIA) between India and the 27-nation European bloc soon to be signed, does not exclude Kashmir, in spite of the fact that India's sovereignty over this territory is not recognized by any European government. All European states recognize Abkhazia as a part of Georgia's territory and condemned Russia's subversion there and the ethnic cleansing of Georgians from it. Yet the EU aid program for Abkhazia is conducted in cooperation with the Russian-sponsored government. After the draft EU directive was announced in July 2013, Jerusalem faced a dilemma. It could not accept the guidelines as initially drafted but did not want EU trade and cooperation to diminish. The Israelis recognized that the Europeans were unlikely to change the language of the directive because, by the time it was announced, it had already been approved by the EU Council's twenty-eight members. The question became how to reach a compromise on the implementation of the guidelines in a more lenient fashion. Friendly European governments stated publicly that they wanted the issue resolved in a manner that would enable continued Israeli participation in EU projects. For example, French foreign minister Laurent Fabius said, "We have to look closer and see if there were things that were not intended, and make changes where changes need to be made without changing the overall approach." German foreign minister Guido Westerwelle said that with "goodwill from both sides, the decision can be implemented moderately." There is a clear precedent for a solution. Jerusalem has long accepted that the 1995 EU-Israel free trade agreement does not give duty-free treatment to agricultural and industrial products originating outside the pre-1967 armistice line. In 2005, Israel signed an agreement with the EU stipulating that all Israeli products imported to the EU duty-free must be accompanied by a certificate of origin "giving the name of the city, village, or industrial zone where production conferring originating status has taken place," and "preferential treatment will be refused to the goods for which the proof of origin indicates that the production conferring originating status has taken place in a city, village, or industrial zone which is brought under Israeli administration since 1967." In the autumn of 2013, Israeli and EU negotiators sought a similar compromise to permit Israeli participation in the important Horizon 20/20 program and other joint projects without spending European funds outside the "Green Line." Brussels proposed that Israeli entities would be allowed to employ subsidiary special purpose vehicles (SPVs) to shield EU financial instruments from ineligible corporate activities under article 12 (b) of the guidelines, "either in the framework of EU-funded financial instruments or otherwise," in any territory across the pre-1967 armistice line. The proposal would allow legal subsidiaries created by their parent as SPVs to raise capital or hold assets and liabilities to apply. The SPV subsidiary of the Israeli entity would have no activities beyond the pre-1967 line and would not use the financial instrument beyond it; thus the SPV of an otherwise ineligible Israeli entity would be eligible. Because Palestinian supporters opposed this solution, some on the European side felt it was overly generous. But for Israel, reliance on the SPV solution would still have injurious legal and political implications. One Israeli official said privately that "if a given mother company has to create a daughter company, that means that from the legal point of view the mother company is not eligible." This would leave many large banks and corporations out in the cold. Also, the mechanism of SPV might not be practical for smaller entities. Israeli negotiators suggested other mechanisms such as a separate bank account within the mother company (thus keeping its eligibility), a solution rejected by Pierre Vimont, executive secretary-general of the European External Action Service (EEAS) on November 22, 2013. But on November 26, Livni and Ashton jointly announced that they had reached an agreement that "fully respects the EU's legal and financial requirements while at the same time respecting Israel's political sensitivities and preserving its principled positions." Israeli officials say that the agreed compromise accepts the SPV method but commits the EU also to consider other methods that are less problematic from the Israeli point of view. Deputy foreign minister Zeev Elkin, a conservative Likud member who oversaw the negotiations along with Naftali Bennett, head of the nationalist Jewish Home party, told Israel Radio that under the compromise, "Every Israeli entity will be able to apply. If it receives the money, it will need to find a mechanism, with the Europeans, that will allow the Europeans to achieve their objective: that their money ... will not go beyond the Green Line." The actual wording of the compromise will not be public until enforcement language is appended to the Horizon 20/20 agreement to be signed in April 2014. Israeli officials believe the final wording will allow any Israeli institution operating both within and beyond the Green Line to apply for EU grants and that each application will be considered according to its individual merit as long as there is a formula to ensure that EU money will not reach the settlements. However, statements from the European Union suggest otherwise. On December 17, 2013, Leonello Gabrici of the European External Action Service stated on behalf of Ashton that the original language of the EU guideline has not been changed. He categorically rejected any amendments to that language because "the guidelines are ... an implementation of the EU's long-standing position regarding the illegality of Israeli settlements. ….The guidelines' publication on 19 July ... made our existing policy clearer, more concrete, and more easily enforceable. Amending ... the guidelines would signal a reverse of EU policy on ... settlements in particular, and this we cannot allow. They will enter into force on 1 January 2014." Draft guidelines published July 19, 2013, included article 12 (b), which unambiguously stated that any Israeli financial instrument operating in any way "either in the framework of EU-funded financial instruments or otherwise" across the pre-1967 armistice line will be ineligible for EU financial instruments, as well as article 16, which required Israeli entities administering financial instruments of an agreement with the EU to certify that they do not operate at all in the territories, either with EU-funding or in any other way. These black letter texts that were reaffirmed on December 17, 2013, are not consistent with the oral understandings that Israeli officials believe to have been reached with Ashton on November 26, 2013. Disapproval of Israeli settlement activity and a desire to impose consequences for this activity is pervasive and intense among officials of the European Commission and its External Action Service. These are the officials who drafted the guidelines to overreach and who will administer application on a day-to-day basis. Will their enforcement follow the plain written language of the guidelines, leading to boycotts of many of Israel's leading companies? Or will they implement the more flexible interpretation that Israeli officials believe has been orally agreed to by Ashton that would permit growing cooperation? The EU will provide an unprecedented package of European political, economic, and security support to both parties in the context of a final status agreement. In the event of a final peace agreement, the European Union will offer Israel and the future state of Palestine a Special Privileged Partnership including increased access to the European markets, closer cultural and scientific links, facilitation of trade and investments as well as promotion of business to business relations. Enhanced political dialogue and security cooperation will also be offered to both states. The EU special envoy for the Mideast peace process, Ambassador Andreas Reinicke, described the European offer as something "very close to a membership," a status he compared to the European Free Trade Association (consisting of Norway, Iceland, Lichtenstein, and Switzerland) whose members have EU privileges through the agreement on a European economic area and various bilateral arrangements. But the flip side of this may be added sanctions in the event that the talks break down since European leaders are poised to blame Israel for failure. If Palestinian president Mahmoud Abbas fulfills his promise to resume political warfare against Israel at the United Nations and other multilateral fora, his supporters in the EU are ready to squeeze Israel's access to European markets. Vice-president Joe Biden said on December 10, 2013, "The wholesale effort to delegitimize Israel is the most concentrated that I have seen in the 40 years I have served." The paramount goal of the BDS movement is a European boycott of Israel. Intentionally or not, the new directive promulgated on July 13, 2013, is a major milestone in this campaign and, surely, will not be the last. Steven J. Rosen served for twenty-three years as the foreign policy director of the American Israel Public Affairs Committee (AIPAC). He is now the director of the Washington Project of the Middle East Forum. "Annex: Support to the European Neighbourhood Policy (ENP) Israel-European Union (EU) Action Plan, 2013," Europa, European Union, Brussels, accessed Jan. 21, 2014. "International Agreements," Official Journal of the European Union (Brussels), Nov. 20, 2012. "ACAA agreement between Israel and the EU ratified," Israeli Ministry of Foreign Affairs, Jerusalem, Oct. 23, 2012; Jewish Telegraphic Agency (New York), Oct. 23, 2012. "Eleventh Meeting of the EU-Israel Association Council," Council of the European Union, Brussels, July 24, 2012. Haaretz (Tel Aviv), July 1, 2013.
 i24 News (Tel Aviv), Nov. 4, 2013; Haaretz, Nov. 4, 2013. "European Union, Trade in goods with Israel," Directorate-General for Trade, European Commission, Brussels, Nov. 7, 2013; "European Union, Trade in goods with Saudi Arabia," idem, Nov. 7, 2013; "European Union, Trade in Goods with Australia," idem, Nov. 7, 2013. CNN Money, Nov. 22, 2013. "Guidelines on the eligibility of Israeli entities and their activities in the territories occupied by Israel since June 1967 for grants, prizes, and financial instruments funded by the EU from 2014 onwards," Official Journal of the European Union, July 19, 2013. "Trading away Peace: How Europe Helps Sustain Illegal Israeli Settlements," crisisaction.org, New York, Oct. 2012, p. 20. The Forward (New York), Mar. 30, 2012. "Conclusions on the Middle East Peace Process," Council of the European Union, Brussels, Dec. 10, 2012. Oded Eran, "The European Union Toughens Its Stand on the 1967 Lines," INSS Insight, no. 447, Institute for National Security Studies, Tel Aviv, July 18, 2013. "Exposing the Israeli Occupation Industry: Leumi Bank," Who Profits from the Occupation [hereafter, Who Profits], Tel Aviv-Jaffa, Aug. 8, 2013. "Exposing the Israeli Occupation Industry: Hapoalim Bank," Who Profits, Aug. 8, 2013. "Exposing the Israeli Occupation Industry: Israel Discount Bank," Who Profits, Jan. 21, 2014. "Exposing the Israeli Occupation Industry: Mizrahi Tefahot Bank," Who Profits, Aug. 11, 2013.
 Financing the Israeli Occupation, Who Profits, Oct. 2010. Ian S. Lustick, "Has Israel Annexed East Jerusalem?" Middle East Policy, Jan. 1997. "EU Heads of Mission Jerusalem Report 2012," posted by European Coordination of Committees and Associations for Palestine, Brussels, Feb. 28, 2013. "Companies Supporting the Israeli Occupation Industry of Palestinian Land," Interfaith Peace and Hoder Investment Research, Providence, R.I., Oct. 2009; "Exposing the Israeli Occupation Industry: Settlements' Products," Who Profits, accessed Jan. 21, 2014. "Exposing the Israeli Occupation Industry: Paz Oil," Who Profits, Nov. 19, 2012. "Exposing the Israeli Occupation Industry: Elbit Systems," Who Profits, Mar. 25, 2008. "Exposing the Israeli Occupation Industry: Matrix IT," Who Profits, Dec. 7, 2008. "Exposing the Israeli Occupation Industry: Keter Plastic Keter Group," Who Profits, July 14, 2010. "Exposing the Israeli Occupation Industry: IDB Group," Who Profits, Feb. 16, 2009. "Exposing the Israeli Occupation Industry: CLAL Group," Who Profits, Feb. 16, 2009. "Exposing the Israeli Occupation Industry: Delta Galil Industries," Who Profits, July 17, 2012. "Exposing the Israeli Occupation Industry: Gilat Satellite Networks," Who Profits, Apr. 4, 2013. "Exposing the Israeli Occupation Industry: Hot Telecommunication Systems," Who Profits, Mar. 20, 2012. "Exposing the Israeli Occupation Industry: Lithotech Medical," Who Profits, Dec. 10, 2008. "Exposing the Israeli Occupation Industry: DNM Technical Equipment and Tools," Who Profits, Dec. 30, 2011. "Exposing the Israeli Occupation Industry: Magal Security Systems," Who Profits, May 23, 2010. "Exposing the Israeli Occupation Industry: Intellitech Engineering Mechanical and Aviation," Who Profits, Oct. 4, 2009. "Exposing the Israeli Occupation Industry: Veolia's Activities in Israel and the OPT: An Overview," Who Profits, Jan. 2012. Palestinian BDS National Committee, July 18, 2013. Eran, "The European Union Toughens Its Stand on the 1967 Lines." "Security of the Airspace," Israeli-Palestinian Interim Agreement on the West Bank and the Gaza Strip, Sept. 28, 1995, annex I: art. XIII. The Times Higher Education (London), Sept. 5, 2013. YNet News (Tel Aviv), Aug. 25, 2013. The Times of Israel (Jerusalem), Dec. 12, 2013. "Overseas Business Risk – Israel," Open to Export, London, Dec. 3, 2013. The Times of Israel, July 23, 2013. Basic Law - Jerusalem - Capital of Israel, Israel Ministry of Foreign Affairs, Jerusalem, July 30, 1980. Rick Richman, "The Second Time Will Be a Tragedy, Too," Commentary, Mar. 26, 2010. "Exchange of Letters between PM Sharon and President Bush," Israel Ministry of Foreign Affairs, Jerusalem, Apr. 14, 2004. The Washington Post, Apr. 24, 2008. The Jerusalem Post, Oct. 14, 2012. Globes (Rishon Le-Zion), July 16, 2013. The Times of Israel, July 17, 2013. The New York Times, Sept. 8, 2013. The Jerusalem Post, Aug. 25, 2013. The Times of Israel, Aug. 11, 2013. Dore Gold, "What should Israel do about Europe?" Israel Hayom (Tel Aviv), Aug. 16, 2013; Eugene Kontorovich, "How the EU directly funds settlements in occupied territory," The Jerusalem Post, Sept. 28, 2013; Avi Bell and Eugene Kontorovich, "EU's Israel Grant Guideline: A Legal and Policy Analysis," Kohelet Policy Forum Research Paper, Jerusalem, Oct. 2013. The Times of Israel, Dec. 25, 2013. "Turkish Cypriot Community," Official Journal of the European Union, Mar. 7, 2006. "EU-Morocco Fisheries Protocol," Western Sahara Resource Watch, Brussels, Sept, 25, 2013; for the EU's treatment of Israel, see The Jerusalem Post, Sept. 12, 2013. Advisory opinion on Western Sahara, International Court of Justice, The Hague, Oct. 16, 1975. "Fisheries Partnership Agreement between the European Communities and the Kingdom of Morocco," art. 2(a), Official Journal of the European Union, May 29, 2006. Erik Hagen, "The role of natural resources in the Western Sahara conflict, and the interests involved," University of South Africa, Pretoria, accessed Jan. 23, 2014. Western Sahara Resource Watch, July 24, 2013; Erik Hagen, " EU-Morocco fish pact: Fish before peace?" Western Sahara Resource Watch, EurActiv.com, Dec. 10, 2013. European Parliament Press Service, Brussels, Dec. 10, 2013. Rediff News (Mumbai), May 13, 2011. The Jerusalem Post, Oct. 3, 2013. "Notice to Importers: Imports from Israel into the Community (2005/C 20/02)," Official Journal of the European Union, Feb. 1, 2005; "Notice to importers: Imports from Israel into the EU (2012/C 232/03)," idem, Aug. 3, 2012; "Notice to importers: Imports from Israel into the Community (2001/C 328/04)," idem, Nov. 23, 2001. "Guidelines on the eligibility of Israeli entities and their activities." "Eurostat's Concepts and Definitions Database," European Commission, Brussels and Luxembourg, accessed Jan. 24, 2014. Palestine News Network (Bethlehem), Oct. 17, 2013. Catherine Ashton and Tzipi Livni, joint statement, European External Action Service, Brussels, Nov. 26, 2013. Arutz Sheva (Beit El and Petah Tikva), Nov. 26, 2013. The News International (Karachi), Nov. 28, 2013. Israel Hayom, Dec. 19, 2013. "Response by Baroness Ashton to Letter re Horizon 2020," The Jerusalem Post, Dec. 17, 2013. "Council Conclusions on the Middle East Peace Process," Council of the European Union, Brussels, Dec. 16, 2013. Andreas Reinicke, interview, Israel Policy Forum, New York, accessed Jan. 24, 2014. Related Topics: Israel & Zionism | Steven J. Rosen | Spring 2014 MEQ receive the latest by email: subscribe to the free mef mailing list This text may be reposted or forwarded so long as it is presented as an integral whole with complete and accurate information provided about its author, date, place of publication, and original URL.